A sand skink in Polk County, Florida. Some of the most striking examples of convergent evolution are found in desert lizards throughout the world. movement through water, and their light underbelly and a gray upper surface make them less visible from both below and above. Some of the most striking examples of convergent evolution are found in desert lizards throughout the world. Australian and North American deserts each support a cryptically colored lizard species that is specialized to eat ants and is protected by sharp spines. The Australian species, the thorny devil ( Moloch horridus, Agamid family) is only distantly related to the American species, the desert horned lizard ( Phrynosoma platyrhinos Iguanid family), as shown by sequencing deoxyribonucleic acid (DNA). They are much more similar anatomically than either is to its closest living relatives. Clearly, the desert environment has posed strong challenges for survival, which have been met by evolution of similar external characteristics. Open sandy deserts pose severe problems for their inhabitants: (1) windblown sands are loose and provide little traction; (2) surface temperatures at midday rise to lethal levels; and (3) open sandy areas offer little food or shade or shelter for evading predators. Even so, natural selection over eons of time has enabled lizards to cope fairly well with such sandy desert conditions. Subterranean lizards simply bypass most problems by staying underground and actually benefit from the loose sand because underground locomotion is facilitated. Burrowing is also made easier by evolution of a pointed, shovel-shaped head and a countersunk lower jaw, as well as by small limbs and muscular bodies and tails. During the hours shortly after sunrise, but before sand temperatures climb too high, diurnal lizards scurry about above ground in such sandy desert habitats. Sand-specialized lizards provide some of the most striking examples of convergent evolution. Representatives of many different families of lizards scattered throughout the world's deserts have found a similar solution for getting better traction on loose sand: enlarged scales on the toes, or lamellae, have evolved independently in six different families of lizards: skinks, lacertids, iguanids, agamids, gerrhosaurids, and geckos. A skink ( Scincus philbyi ), appropriately dubbed the "sand fish", literally swims through sandy seas in search of insect food in the Sahara. These sandy desert regions also support lacertid lizards ( Acanthodactylus ) with fringed toes and shovel noses. Far away in the Southern Hemisphere, on windblown dunes of the Namib desert of southwestern Africa, an independent lineage of lacertids has evolved a similar life form, Meroles anchietae. Such organisms that fill similar ecological niches in different regions have undergone convergent evolution and are called "ecological equivalents." In North America, this body form has been adopted by members of the iguanid genus Uma, which usually forage by waiting in the open and eat a fairly diverse diet of various insects, such as sand roaches, beetle larvae, and other burrowing arthropods . They also listen intently for insects buried in the sand and dig them up. Sometimes they dash, dig, and paw through a patch of sand and then watch the disturbed area for movements. All of these lizards have flattened, duckbill-like, shovel-nosed snouts, which enable them to make remarkable "dives" into the sand even while running at full speed. 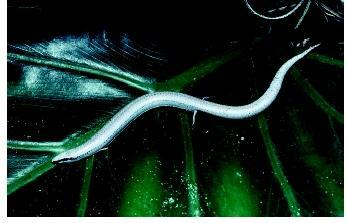 The lizards then wriggle along under the surface, sometimes for over a meter. Pianka, E. R. Evolutionary Ecology, 6th ed. San Francisco, CA: Addison-Wesley-Longman, 2000.